Around 1.5 crore tax payer of India, with income up to 10 lakh, do not participate in equity market as they don’t have demat account, To encourage equity participation by this group government has introduced latest equity based tax saving scheme named as “Rajeev Gandhi Equity Saving Scheme” in this year budget. Let’s discuss about this scheme. 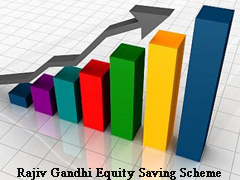 Rajiv Gandhi Equity Savings Scheme (RGESS) is a new equity tax advantage savings scheme for equity investors in India. Only direct equity investments in equity will be eligible for tax deductions, and not the Mutual fund investments. Only new retail investors are allowed to invest up to Rs 50,000 directly in equities, an income tax deduction of 50 per cent. The scheme would have a lock-in period of three years and churning of portfolio is not permitted during the first one year. The scheme can be availed only once in a lifetime. Three years (to get tax deduction in addition to 80 C). In Rajiv Gandhi Equity saving scheme, nothing is clear on this as of now for premature withdrawal. Investments under the new scheme may initially be allowed only in the top 100 or 200 companies (on the basis of market capitalization) listed on various stock exchanges. 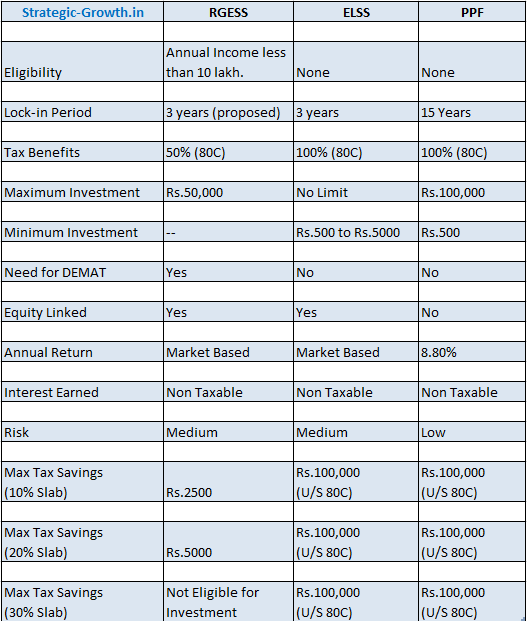 Looking at above benefit provided for investment in RGESS is limited compare to ELSS and PPF. 1. Scheme opens only to new investors (not existing investors). 2. Only a segment of retail investors can invest in RGESS scheme as those whose annual income is Rs 10 lakh or more are not allowed to invest in this scheme. 3. Limit on Investment amount. 4. Investment will only be through direct equities, not mutual funds. 5. Tax benefit is not adequate. As full information of this scheme is not available It is quite unfair to rate this scheme as on today. Investor has to wait and watch till entire scheme information is out for further clarification. Still we believe that this scheme will give benefit to investor and shows them way towards equity investment. Yet Notification from Government is awaited. Is it not available to those individuals who have demat account and have invested in equity shares through their account? Yes you are correct.If you already have demat account than you will not able to participate in this scheme.